Congratulations to our Top Poster of the month! 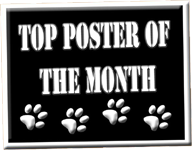 The challenge is on..... can you be our next Top Poster of the Month? Hahaha. That's how I felt when I won two months in a row some time back. What's A Picture Without Loki?